The third summit between South and North Korea held on Friday at Panmunjeom marked a major technological difference from the previous talks in 2000 and 2007. 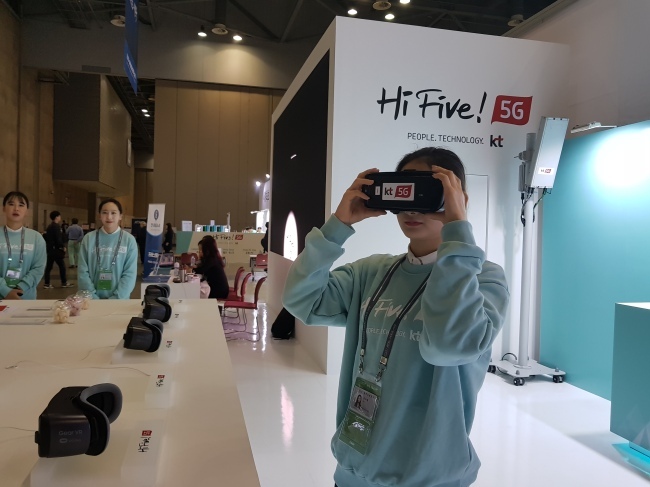 South Korea’s mobile carriers KT and SK Telecom actively supported the historical event with cutting-edge fifth-generation telecommunications technologies to promote their upcoming mobile services to international viewers. Among others, the most attention-grabbing feature was 360-degree virtual reality viewing technologies boasted by each telecom company. KT, the main overseer of the telecom infrastructure for the summit, installed a 360-dgree camera at Freedom House where the leaders of the two Koreas announced a joint statement. The KT camera streamed the after-talks briefing live through its 5G network station established at Kintex, Ilsan in Gyeonggi Province, to around 20 head mounted devices and 5G-enbaled tablet PCs that were placed at KT’s 5G exhibition booth at Kintex, where around 3,000 international broadcasters and journalists filed stories of the day. By putting on a HMD, journalists could view all around the inside of the Freedom House by slightly tilting their heads to experience the restricted location via the VR technology as if they are there. The first direct hot-line between the South and North was set up by KT in 1971. And in 2005, the first optical network connection with the North was made by the mobile carrier. It also supported the previous two inter-Korean summits in 2000 and 2007. KT also introduced other 5G-enabled services to the foreign media outlets by running 5G-based shuttle buses from Wednesday through Friday, including 5G Robot Arm, a robot controlling technology, and 5G Connected Speed, a racing game. SK Telecom installed a 199-inch smart wall inside the press center, which allows up to 16 users to view videos and check news headlines. 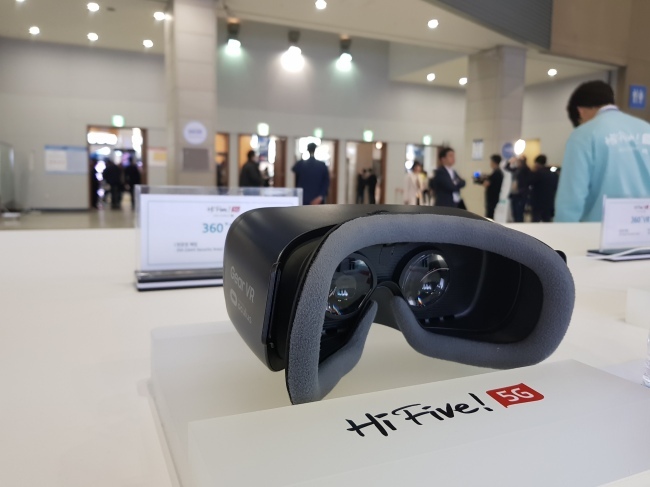 SKT also prepared the 360-degree VR view service by preparing HMDs that provided 8K picture quality for delivery of the summit briefing. “SKT’s VR streaming will be differentiated with its Viewport feature,” an SKT official said. “It will automatically raise the definition of where a user looks with the goggles on, helping improve picture quality of VR content,” an SKT official explained. “Although we are not installing our network at Panmunjeom, we will focus on using this major opportunity to promote our ICT technologies to global media,” the official said.